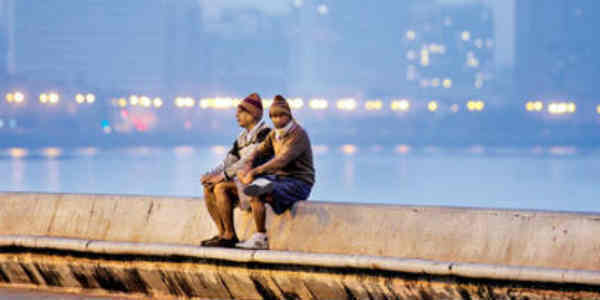 As expected, minimums have increased by 1℃-2℃ over the regions of Vidarbha and Marathwada during the last 24 hours, thereby leading to abatement of cold wave condition from these regions. City wise, Nagpur in Vidarbha region has recorded minimums around 9.4℃, followed by Amravati around 13.2℃ in the last 24 hours. Likewise, minimums over Aurangabad in Marathwada region has been recorded around 15.4℃,followed by Nanded around 15.5℃. Moreover, warm and humid southeasterly winds from Bay of Bengal have started making an appearance over the regions and are expected to continue for next 48 hours. Thus, a further increase in minimums of both Vidarbha and Marathwada is expected. On the other hand, temperatures of North Madhya as well as Konkan & Goa have started showing a decrease. Further, as the time progresses, these are expected to dip down even more. Thus, the temperatures across four major regions of Maharashtra will remain contradictory to each other in the coming days. With clear sky, gentle breeze, cool and dry weather, winter season is the most preferred time for visiting the state of Maharashtra. Be it a sea beach or hill station, Maharashtra is the one destination for all during winters i.e. between November to February. According to political boundaries, the state has mainly four regions including Vidarbha, Marathwada, Madhya Maharashtra and Konkan region.